is an old expression in vet medicine. After all, we hate even thinking of pets getting sick so we avoid planning though it's nearly inevitable that you will get unexpected surprises. Most likely when you can least afford it. Unless you have set up a savings account for your pets coverage, you really need to think about a monthly prepaid plan. 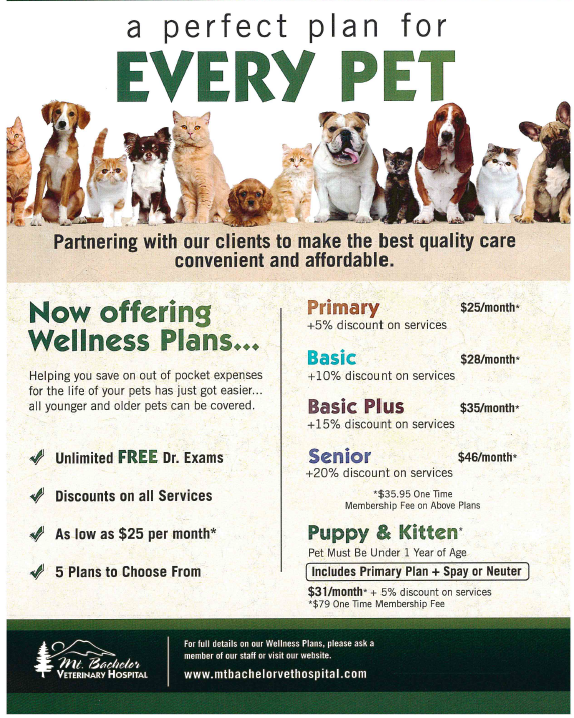 Mt Bachelor Vet Hospital offers the proven economical way to even out pet care expense. And best of all, it pays for PREVENTATIVE care and yearly maintenance care that heads off big bills and catastrophic illness before maladies in our pets get serious and costly. For as little as $25.00 per month you get unlimited office visits (no catches really!) 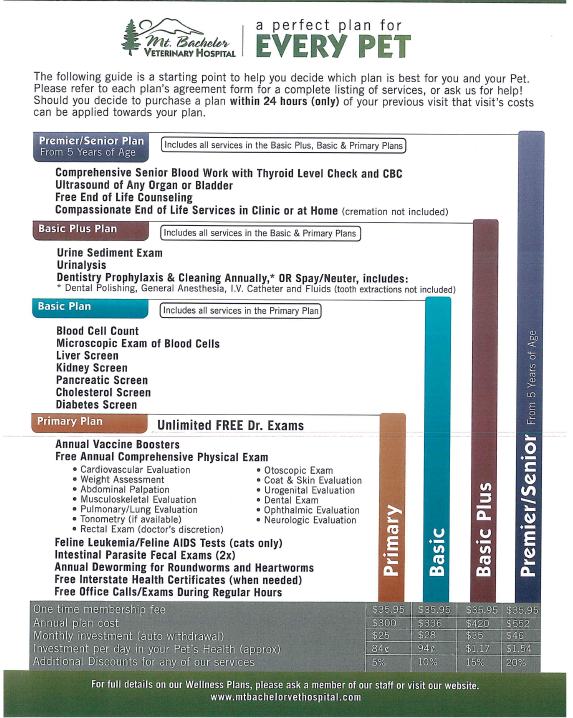 plus no cost vaccinations as needed and discounts on all services done by us. Four different plans allow you to choose the discounts that fit your needs, 5%-20% off the regular prices of ALL services with increments in between. Best of all it comes out of checking automatically and is always there at anytime without the need to set it aside. If you are caught off guard and put it on the credit card imagine the interest charges. Pet insurance products often exclude many problems, pre-existing conditions, recurrence of a previously insured condition and the offer wordings are difficult to understand. There’s no catches with our plan. Please read the materials on this site and come in to discuss any questions or call. If you sign up on your next visit within 24 hrs, that exam is covered under your new plan!